The decreasing cost of powerful fighter aircraft is paving the way for rising powers to invest heavily in potent air dominance and air superiority platforms, taking the fight to regional powers and increasing the competition for Australia, its allies and the F-35 fleet. While established powers like China, Russia and India have increasingly well resourced and developed fighter aircraft fleets and supporting doctrines, Indo-Pacific Asia's rising powers are leveraging the proliferation of advanced fighter aircraft and international collaboration to develop their own multi-generational fighter fleets. In the first article, Asia's simmering fighter race, we outlined the characteristics and capabilities of various generations of operational fighter aircraft in the region and went into detail on the existing and future fighters being introduced by China, Russia and India. Following on from that, in this final article we will take a closer look at the growing and evolving fighter fleets of Vietnam, Singapore, Malaysia, Indonesia and Thailand. Vietnam People's Air Force: Integrating an eclectic combination of US and Soviet designed air frames in the aftermath of the Vietnam War presented a series of operational and logistical challenges for the Vietnamese Air Force, which saw a large-scale transition towards the introduction of high-capability fourth and 4.5 generation fighter aircraft. As a result of this shift, Vietnam operates a relatively small, yet highly capable fleet of dedicated fighter, multi-role and fighter bomber aircraft, with ambitions to continue upgrading their air combat capability. Sukhoi Su-22: A Soviet designed third-generation, variable-sweep wing fighter bomber, Vietnam's fleet of 36 Su-22 serves a similar role to Australia's retired F-111 fighter-bombers, with greater focus on close-air support. The aircraft have a combat range of about 1,150 kilometres and top speed of Mach 1.13, and are armed with dual 30mm cannons and 12 hardpoints capable of integrating a range of Russian designed and manufactured air-to-air, air-to-ground and air-to-surface munitions, including 'dumb' and 'smart' bombs, with a max load capacity of 8,800 pounds. Sukhoi Su-27: A twin-engine, super-manoeuvrable fighter aircraft designed to counter American fourth-generation fighters like the US F-14 and F-15 aircraft. The Vietnamese Air Force operates 11 of the Su-27P/SK/UBK variant across its 37 fighter squadrons. The Su-27SK variant, which serves as the base model for the Vietnamese operated variants, has a range of between 1,340 kilometres (at sea level) and 3,530 kilometres (at altitude) and a max speed of Mach 2.35. The aircraft is armed with a single 30mm cannon and has 10 hardpoints capable of carrying a range of Russian made air-to-air, air-to-ground and air-to-surface munitions, including 'dumb' and 'smart' bombs with a maximum load capacity of about 10,000 pounds. Sukhoi Su-30MK2V: Vietnam's 36 Su-30MK2 serve as the backbone of the nation's air superiority fighter force and are similar to their Russian and Chinese counterparts. The Su-30 has a max speed of Mach 2 and range of about 3,000 kilometres. The aircraft is armed with a single 30mm cannon and 12 hardpoints capable of carrying a variety of Russian and Chinese made air-to-air, air-to-ground and air-to-surface munitions, including 'dumb' and 'smart' bombs with a maximum load capacity of about 18,000 pounds. Vietnam's proximity to and interests in the South China Sea and historical disputes with China have required that the nation maintain a well-rounded, yet highly capable fighter force capable of competing with larger nations and will continue to form the backbone of their strategic and tactical response to the rapidly changing region. Republic of Singapore Air Force: Singapore's strategic location at the confluence of the Malacca Strait and hub for south-east Asia finance, logistics and business has resulted in the need for a robust, balanced and highly-capable fleet of fourth and 4.5 generation combat aircraft. Dominated by advanced variants of both the F-15E Strike Eagle and F-16 Fighting Falcon aircraft, Singapore's Air Force is an often under-estimated modern regional air force. Boeing F-15E/SG: A specialised variant of the F-15E Strike Eagle, the 40 SG variants of the venerable Eagle platform provides Singapore with a robust air superiority and long-range strike capability. The F-15E has a combat range of about 1,270 kilometres and max speed of Mach 2.5+, and is armed with a single 20mm cannon and is equipped with multiple hardpoints across the fuselage and wings, supporting a range of US made air-to-air, air-to-ground and air-to-surface munitions, including 'dumb' and 'smart' bombs and external fuel with a total capacity of about 23,000 pounds. Lockheed Martin F-16C/D: Singapore's fleet of 60 F-16 variants serve as the backbone of the nation's Air Force in a variety of multi-role, interdiction, interception and air superiority roles. The aircraft have a combat range of about 550 kilometres with a max speed of Mach 1.2 (at sea level) and Mach 2 (at high altitude), and are armed with a single 20mm cannon and 11 hardpoints across the wings and fuselage supporting integration for advanced US made air-to-air, air-to-ground and air-to-surface munitions, including 'dumb' and 'smart' bombs and external fuel with a total capacity of about 17,000 pounds. Singapore's relatively small air force and the limited range, at least of the F-16 fleet, may seem like a tactical and strategic weakness. However, the established fleet of airborne early warning and rapidly modernising fleet of aerial refuelling platforms, including five new KC-30A multi-role tanker transports, increase the operational range and survivability of key air combat assets. As part of the broader modernisation and recapitalisation of the Singaporean Air Force, the current program to replace the F-15 and F-16 platforms is seeking foreign bids, which has drawn attention from European, Russian and Chinese aircraft manufacturers and Lockheed Martin, with its fifth-generation F-35 'A' and 'B' variants serving as key offerings for the island nation. Sukhoi Su-30MKM: A specialised, Malaysian-only variant of the Su-30 platform, the 18 Su-30s serve as the core of Malaysia's air combat capability. Like its Russian, Chinese and Vietnamese counterparts, the Malaysian Su-30MKM variant has a max speed of Mach 2 and range of about 3,000 kilometres. The aircraft is armed with a single 30mm cannon and 12 hardpoints capable of carrying a variety of Russian made air-to-air, air-to-ground and air-to-surface munitions, including 'dumb' and 'smart' bombs with a maximum load capacity of about 18,000 pounds. Boeing/McDonnel Douglas F/A-18D Hornet: Serving as an all-weather strike aircraft, the D variant of the 'Classic Hornet', Malaysia's modest fleet of Hornets serves in a complementary role to the larger, Su-30MKM aircraft. The 'D' variant of the Hornet has a combat range of about 741 kilometres when equipped for an air-to-air mission, with a max speed of Mach 1.8 and is armed with a single 20mm cannon, supported by nine hardpoints across the wings and fuselage for integrating US made air-to-air, air-to-ground and air-to-surface munitions, including 'dumb' and 'smart' bombs and fuel with a maximum load capacity of 13,700 pounds. Sukhoi Su-27: A twin-engine, super-manoeuvrable fighter aircraft designed to counter American fourth-generation fighters like the US F-14 and F-15 aircraft. The Indonesian Air Force operates five of the Su-27SK variant across its 37 fighter squadrons. The Su-27SK variant, which serves as the base model for the Vietnamese operated variants, has a range of between 1,340 kilometres (at sea level) and 3,530 kilometres (at altitude) and a max speed of Mach 2.35. The aircraft is armed with a single 30mm cannon and has 10 hardpoints capable of carrying a range of Russian made air-to-air, air-to-ground and air-to-surface munitions, including 'dumb' and 'smart' bombs with a maximum load capacity of about 10,000 pounds. Sukhoi Su-30MKK: Indonesia's 11 Su-30MKKs serve as the next-generation of the nation's air superiority fighter force and are similar to their Russian, Chinese and Vietnamese counterparts. The Su-30 has a max speed of Mach 2 and range of about 3,000 kilometres. The aircraft is armed with a single 30mm cannon and 12 hardpoints capable of carrying a variety of Russian and Chinese made air-to-air, air-to-ground and air-to-surface munitions, including 'dumb' and 'smart' bombs with a maximum load capacity of about 18,000 pounds. Sukhoi Su-35: An evolution of the Su-30 series, the planned 11 Su-35s will provide the Indonesian Air Force with a 4.5 generation fighter aircraft, incorporating a range of advanced radar cross section reducing design traits and materials combined with super-manoeuvrable engines. Su-35 has a max speed of Mach 2.25 and combat range of about 1,580 kilometres. The aircraft are armed with a single 30mm cannon and are equipped with 12 hardpoints capable of carrying a variety of Russian made air-to-air, air-to-ground and air-to-surface munitions, including 'dumb' and 'smart' bombs with a maximum load capacity of about 18,000 pounds. Lockheed Martin F-16C/D: Indonesia's fleet of 32 F-16 variants serve as the backbone of the nation's Air Force in a variety of multi-role, interdiction, interception and air superiority roles. The aircraft have a combat range of about 550 kilometres with a max speed of Mach 1.2 (at sea level) and Mach 2 (at high altitude), and are armed with a single 20mm cannon and 11 hardpoints across the wings and fuselage supporting integration for advanced US made air-to-air, air-to-ground and air-to-surface munitions, including 'dumb' and 'smart' bombs and external fuel with a total capacity of about 17,000 pounds. Indonesia's growing prosperity, combined with its strategic and tactical operating reality have resulted in growing pushes to modernise the capability of the Air Force, with a focus on 4.5 generation platforms and industrial development programs with nations like Russia and South Korea as the nation seeks to expand both the capability of its local defence industrial base and advanced manufacturing sectors and the capability of its own Air Force. 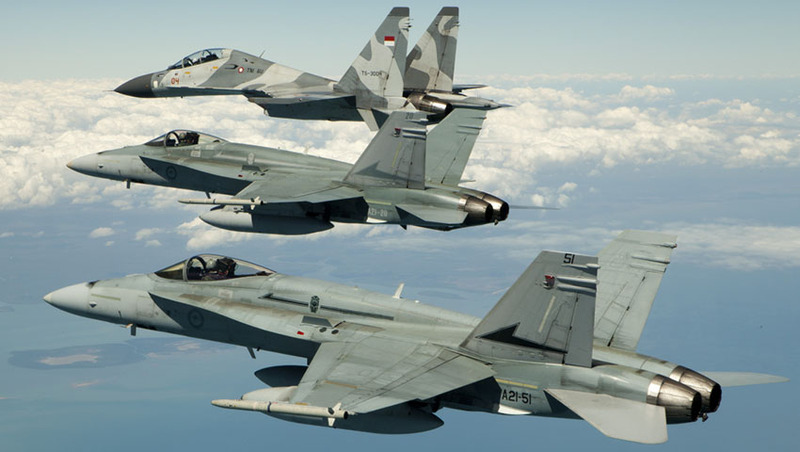 The Indonesian joint venture with Korea Aerospace Industries on the KF-X program, which is currently in development, seeks to provide both Indonesia and Korea with a low-observable, network-centric, twin engine fighter aircraft, with capabilities beyond both the Dassault Rafale and Eurofighter Typhoon, but less than the F-35. Royal Thai Air Force: Thailand's Air Force, like many of its south-east Asian counterparts, operates an ecclectic mix of third and fourth-generation fighter aircraft, ranging from ageing F-5s to more modern F-16 and Saab Gripen variants, each serving different tactical and strategic roles within the nation's Air Force. Northrop F-5E: Originally designed and introduced in the late 1950s, the small fleet of F-5Es have served as Thailand's premier fighter since they were gifted as part of US anti-communist aid during the 1960s until the introduction of the F-16 and Gripen air frames. The F-5E has a range of about 1,405 kilometres and a max speed of Mach 1.6 (at altitude), and are armed with dual 20mm cannons and seven hardpoints across the wings and fuselage for integrating US manufactured air-to-air, air-to-ground and air-to-surface munitions, including 'dumb' and 'smart' bombs and external fuel with a total capacity of about 7,000 pounds. Lockheed Martin F-16ADF: Thailand's fleet of 38 F-16 variants serve as the backbone of the nation's Air Force in the air defence, interdiction, interception and air superiority roles. The aircraft have a combat range of about 550 kilometres with a max speed of Mach 1.2 (at sea level) and Mach 2 (at high altitude), and are armed with a single 20mm cannon and 11 hardpoints across the wings and fuselage supporting integration for advanced US made air-to-air, air-to-ground and air-to-surface munitions, including 'dumb' and 'smart' bombs and external fuel with a total capacity of about 17,000 pounds. Saab Gripen JAS 39C/D: The contentious purchase of the Gripen aircraft provides Thailand with an advanced fourth-generation platform to complement the role of the larger F-16 variants, with additional purchases expected to bring the Thai Gripen fleet to 18 air frames. The aircraft has a combat radius of 800 kilometres and max speed of Mach 2 (at high altitude), and is armed with a single 27mm cannon and eight external hardpoints across the wings and fuselage, capable of integrating both US and Swedish designed air-to-air, air-to-ground and air-to-surface munitions, including 'dumb' and 'smart' bombs and external fuel with a total capacity of about 11,700 pounds. Australia Forward: Balancing expeditionary and con... - 7 hours ago.